Invisalign has created line geared specifically to the unique needs of teenagers. Here's what makes Invisalign Teen different – and great for teens! Invisalign is a series of clear, smooth plastic aligners used to straighten teeth. They’re transparent, so it’s virtually impossible to see them when they’re being worn, making them great for adults and teens who are concerned about the aesthetic impact traditional braces might have on their smiles. The aligners are also removable. This allows you to brush and floss just like you normally would, and that you can eat all the foods you love as well, without restriction. The above characteristics are those that Invisalign and Invisalign Teen share, but there are a few important extra features that Invisalign Teen has, to make it more suitable for teens specifically. Invisalign Teen was developed specifically to address the barriers teens tended to face when it came to using Invisalign. Invisalign Teen aligners have small blue dots on them that fade away after the aligners have been worn for two weeks. On average, teens tend to be less compliant, and don’t always wear their aligners as prescribed. Compliance Indicators help them keep track of how long to wear their current set of aligners before changing them. The blue dots will only fade when the aligners have been actually worn for a total of two weeks, or 336 hours, allowing the necessary tooth movement to take place. Invisalign Teen can been prescribed to younger teens whose adult teeth are still growing in. The aligners have spaces in them that allow the adult teeth to erupt through. Teens are more likely than adults to accidentally lose or damage their aligners. Invisalign Teen comes with 6 sets of replacement aligners to help reduce the treatment delays and dental health problems that can result from lost or broken aligners. 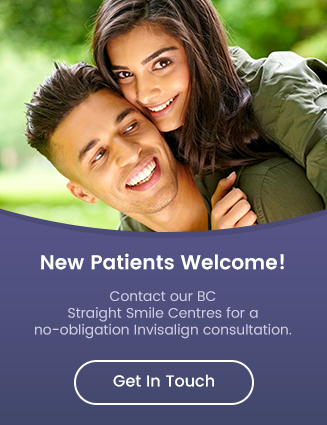 If you think Invisalign Teen might be the right orthodontic treatment choice for you, contact Straight Smile Centres for a consultation today!